It served its purpose but since it automatically got migrated to Echo which is only free for awhile, I decided I might as well go back to Blogger's own commenting system. Well, maybe cutting my arm off was too dramatic an analogy, but still, all those years of comments... gone! While I was at it, I decided to change the colours to a more spring-based palette. And I'll add this butterfly for good measure. 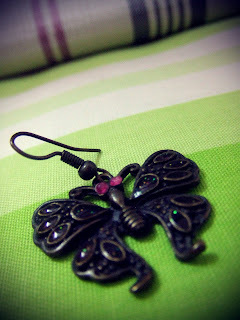 It was my first butterfly earring, but I had accidentally dropped it, and its wings were clipped off. Even after trying to glue it back, it was still very flimsy (the injured not shown here). Oh well, butterflies to look forward to spring. I know, I'm not even in a four-season country anymore, but it's still nice to have something at the back of my mind. These days it's been so hot I've forgotten how winter feels like anymore!